I have been reading this modern day, Las Vegas-based adventure-supplement with interest. Part-background for a cult, part-adventure – it also contains a bunch of information and several spot rules – the last of which fits Call of Cthulhu, but has less value for The Cthulhu Hack. Lost in the Lights – including the adventure Invisible Sun – provides a lot of potential. It has been available in a couple of formats in the past – physical and PDF. In the last week, it was released as a physical book in the UK. For information, I have read this supplement through a couple of times with plans with run it in the near future. This is not a review – this is a view, based on my reading and interpretation of the materials. In my opinion, the adventure won’t require much prep for The Cthulhu Hack – which I’ve always presented as the strong point of the system – as key clues and locations appear in small capitalised text and the few stat-blocked antagonists can slide over to TCH on the fly. At heart, the adventure either hurts hard or will require some cautious and somewhat structured investigation – you’ve no need to worry about complex conversion for prolonged gun battles or weird esoteric spell play. You may want to highlight the clues in different colours to call them out for ease of visibility in play or make some additional notes. My personal favourite would be a combination of highlighting (or use of opaque Post-It markers) and some notes in the margin (or Post-Its, if you’re squirming at the prospect of writing in a book). With a PDF version, you could annotate the text on a tablet (though see below, as currently I don’t believe a PDF exists). Some of what follows contains spoilers – so if you’re the perennial player and might end up being the investigator rather than the show runner, stop here! The supplement handles details of a new cult – and then the investigation sets out a faction of that cult in action. The source of the cult lies far away – so if the events go down and the protagonists in Las Vegas collapsed or implode, the threat remains. Indeed, what this cult believes could easily translate wholesale into other sects and realms of worship, possibly without any real understanding of the Mythos. The first section of the book goes into considerable detail about the origins of the cult. With this material, not only can you rely on its remote source to keep it tenable, you have a timeline (and guidance) on having it as the antagonist for investigations stretching back through the ages. As a GM of any game revolving around the Cthulhu Mythos you have to remember the long game. Very few of the entities of the Mythos keep to some 5-year plan! Indeed, it’s the cults, sects and covens that have the plans – as the entities themselves exhibit (rightly) an alien quality that defies reasoning in human terms. The people of Earth mean nothing to them – they might provide momentary sustenance or a trickle of extra-natural energies, but little else. For some, Earth might as well be a buffet, for others the timescape of our world provides a curious diversion or a convenient battleground. The strangest thing about the cult herein relates to the mind set. The book goes to some effort explaining why the people in this cult pursue their worship of the Mythos entities. No sane or balanced individual would consider this worship as anything but suicidal. I found myself reading the explanation and still wondering why – and, in truth, my stance, I hope, means I lack the ingrained sociopathic world view. That’s a good thing. I get it that people exist on a spectrum and I’m holding on tight to the barrier well away from the need for death-defying thrills or adrenalin junkie-ism. At heart, this investigation involves a missing girl. The way the player characters approach the investigations matters a lot. Careful and low key will make for an entirely different adventure to all guns blazing. Indeed, all guns blazing will end in a Total Party Kill 9 times out of 10, with certainty. The antagonists have no qualms about silencing those who would interfere – and anyone making noise will drown out the hushed cover-ups and clues, simply drawing attention without benefit. The adventure contains a fair smattering of exposition, background reading and rule additions (for Call of Cthulhu 7e) at a tangent to the absolute necessary. The GM could skip a fair few pages and run the adventure without reading this material in detail – though it might make it harder to improvise and adapt to the unexpected. A section on the effects of radiation – in the real world and game terms – you could skip altogether and just run on the fly with typical preconceptions. I have a strong feeling that you could, with consideration and a careful eye on timing, run this adventure in a single session. You might, with a secure grip on the reins, reach a conclusion in a convention slot. However, the wealth of material here means you could also run this with less pace and more emphasis on atmosphere. Heck, you might go all David Lynch on this bad boy and turn it into something very peculiar (why not turn on a loop video of a long dark road and just walk away from the table for 10-minutes?). In terms of characters, you can approach this with existing groups or generate something on the spot. The adventure allows for – and supports – groups with or without law enforcement powers. Actually, possession of some measure of authority serves to simplify and complicate. It can mean getting easier access to people and locations to pose questions, but more often than not puts them on edge. The book closes with a gathering of hand-outs, otherwise scattered around the text at relevant points. I like that. Yes it takes up a bunch pages with duplicated material, but Lost in the Lights has made some seriously immersive and engaging hand-outs. As a modern adventure, you can find clues scattered everywhere – news footage, web pages, text messages. The adventure was originally released a few years ago as a PDF by Sixtystone Press. At the time of that release they also made an enhanced hand-out pack available, which allowed the GM to tweak the details – like changing dates or specific references. That level of personalisation appeals to me – but, the website offers only dead links for the PDF and enhanced hand-outs. I have dropped them a note to see whether these will become available again, as the hand-out personalisation takes things to a whole new level. I can see why the PDF might be unavailable at the moment, with the recent release into print for this updated 7th edition version, but I’m not certain why the hand-outs have disappeared, as these are not system dependent. I like the potential of this investigation because it offers a slice of lore, a chapter in the existence of a cult that has persisted through centuries and won’t fall because the investigators poked out a block in the Jenga tower. Thro’ Centuries Fixed references the use of an adventure as a sort of teaser, a glimpse of a broader campaign. 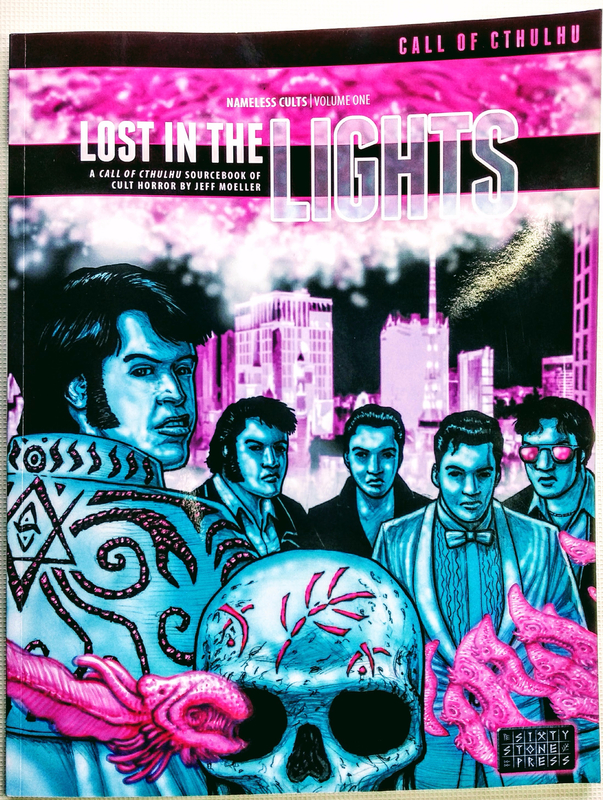 Well, Lost in the Lights does more than offer a passing reference to the idea in the margins – with the detail and timeline about the cult, you have the basic building blocks to create call backs and echoes long after the dust has settled in Vegas. That the book sells itself as both adventure and supplement means you have more than just a one-off when you make this purchase. The inclusion of all the additional material around the cult, the worshippers, their motivations and so forth means that Invisible Sun can serve as a first step in a longer campaign arc. The cult could serve as a focus or a sub-plot recurring malefactor. On the caveat of this being a view rather than a review, I give this a thumbs up. Check out Lost in the Lights on the Sixtystone Press website, and in PDF through RPG Now. Thanks. My long lost baby has finally resurfaced!